What makes a criminal’s mind different? How is a criminal’s mind different from a mind of someone who is not a criminal? According to Clara Moskowitz from LiveScience.com, many convicted criminals have an antisocial personality disorder. When someone has this disorder they have difficulty determining what is right and what is wrong. She then goes on to explain a study that was done in 2008 in which 27 people who were diagnosed with an antisocial personality disorder were compared to 32 people who were not diagnosed with a personality disorder. The results of the experiment showed that people with the disorder had a malformation in their amygdala in which there was a weakening in the outer layer of the cortex. According to the article 10 Incredible Facts About the Criminal Brain, brain tumors could also influence the probability of someone acquiring the disease. An example of this specific instance happening was with Charles Whitman, the man who murdered his mother, wife, and 14 people at the University of Texas. According to Biography.com, the police autopsy reported that he had a brain tumor. Adrian Raine, a professor from University of Pennsylvania, states that genetics are an important factor in determining if someone will or will not inherit criminal characteristics. Raine also mentions that the amygdala deformations can cause people to lack personality characteristics that can cause them to be less empathetic and not feel remorse for their actions. The website APA.org states that intervention can also influence a persons future actions. At a young age, if the children are enrolled in enrichment programs, the probability that they will become a criminal later in life is reduced. A mothers actions can also influence the outcome of the child. The University of Colorado conducted an experiment and discovered that if a home nurse visits a pregnant women to assist her nutrition and daily habits, it could have a positive effect on the baby after it is born. A criminals brain is very different than the average brain. Before researching this topic I assumed that the things that made a criminal a criminal were just in the individuals personality. I had no idea that they were actually related to a mental illness and could even be genetic. This entry was posted in Uncategorized on September 15, 2016 by Mallory Dixon. I’ve always been interested in what makes someone a killer or serious criminal, so this post was really fascinating. My english teacher during my senior year of high school was obsessed with the subject, so we used to discuss what makes someone become a serial killer. We usually ended up agreeing that a criminal has a mental health issue, and it often doesn’t present itself unless they are triggered by a traumatic event, in which case they begin to lash out against others. This isn’t to say that some people aren’t just born with a criminal’s mindset, but It’s interesting how different a criminal’s brain is from that of an everyday person. I find abnormal psychology is interesting!! I have been reading a book called “The Devil in the White City” By Erik Larson. This book a Nonfiction novel bout the Columbian World Fair Exposition that was in Chicago towards the end of the 19th Century. This book goes on to describe the process of this beautiful event and all the work that went into the architecture. This is juxtaposed with following the story of a man that used the World Fair to set up an hotel and murder people. This dude was absolutely insane… but he was quite a genius for the fact that he really was able to pull it off. I am very curious how someone like that could develop. Was he born like that? That is why I like your post because it agrees with the idea that his brain was different from everyone else’s. There was something in his brain that worked really well and a lot that did not. I am curious how our environment can affect brain growth because I can’t imagine that psychopaths are crazy from the day they were born. I took a class in high school called Law & Justice and we talked about this a lot! I’ve always found topics like this interesting. In that class, we also discussed criminals with other mental illnesses which may cause them to commit the crimes. I found an article that argues why criminals with illnesses such as bipolar disorder should be given treatment for these illnesses, rather than thrown into jail. This is a pretty controversial subject but I love reading about it and periodically researching was progression has been made towards better understanding criminals and their mental illnesses. In high school I took a forensics course and I was extremely interested in it. I loved learning about crime scenes and investigations, so this post was right up my alley! I find it intriguing that most criminals have a mental illness that takes over their mind. Here is an interesting article with facts about criminal minds that you should take a look at! The title of this post immediately drew me in because for some reason I always watch those shows on TV about finding criminals and the details of what made them do it. It seems like the parents have a big responsibility in why they commit these crimes. Whether that be through simple unfortunate genetics or some very poor parenting skills while these criminals were young. 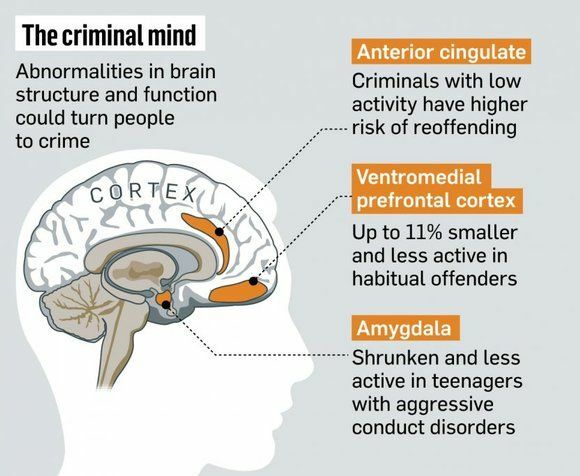 The brain development of a criminal truly is different than that of a non-criminal which is fascinating. Almost makes me feel a bit of remorse towards them! This article appealed to me as soon as I read the title. In high school, I wrote a research paper on the juvenile death penalty and whether or not it should be legal. The reasoning behind this argument uses the same sort of research with psychology and the brain, along with any differences that a child’s brain may have compared to an adults, just like how you’ve compared a criminal’s mind to a regular one! The pre frontal cortex assess risk, and this part of our brain isn’t fully developed until we are around 21 years old. Therefor, this could add to your argument! If a criminal is below the age of 21, not only may they have a personality disorder and/or brain tumor, but their brain may not be fully developed yet.